Grigori Frid (1915–2012) was an important figure in Soviet-era Russian music, though he is little remembered today outside his homeland. He was a prolific composer in most genres, and his two chamber operas have proved his most successful works: The Diary of Anne Frank (1969) and Van Gough’s Letters (1975), the Anne Frank opera appearing in many Western countries, and as recently as this year in a new production at the Mariinsky. Frid’s life story is a typical one of struggle against adversity in the early decades of the Soviet Union: His parents were both musicians, but his father spent five years in prison from the late 20s, on trumped up political charges obscuring real reasons still unknown. Frid was a pupil of Vissarion Shebalin and Heinrich Litinsky at the Moscow Conservatory in the 1930s, and, after military service in an army band during the war, became a key figure in promoting new musical talent in Moscow from the 60s onwards, not least through his Moscow Musical Youth Club, which hosted first performances of many works by the younger generation of avant-gardists. After his death, that organization was taken over by the composer Alexander Vustin, who seems to have become a spokesman for Frid’s legacy, and provides the biographical liner note to the present release. 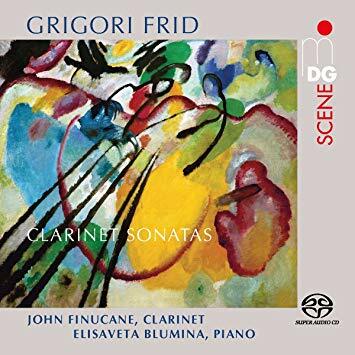 For all the oppression and hardships of Frid’s background, the musical personality he projects in these clarinet sonatas is surprisingly upbeat. His long career spanned several changes of style and approach, from an early Socialist Realist Gulag Neoclassical conformity, via experimentation in 12-tone techniques to a Modernist and tonally ambiguous late style. The three sonatas, dated 1966, 1971, and 1982 trace that evolution, yet the similarities outweigh the differences. All exhibit open and expansive textures, the music based on clearly identifiable melodic patterns, stridently presented and then inquisitively developed in the clarinet line, while the piano supports with a wide range of textures and moods, all equally open and attractive. The first two sonatas are the most conventional. Both are in a fast-slow-fast three-movement form, and both broadly tonal. The style is not overtly Russian, though an insistent ostinato in the finale of the First Sonata suggests a Shostakovich influence, as does the work’s abrupt ending. The Second Sonata is more extrovert and ambitious, especially in the ever-more dramatic development section of the first movement, and the music moves further from Classical sonata models in its almost static middle movement and in the quiet coda to the finale. But a bigger stylistic jump takes us to the opening of the Third Sonata. This work is in just two movements, an introductory Adagio followed by a substantial Allegro. Frid’s cheerful disposition finally drops here, and the first movement introduces a somber mood that the following Allegro never fully shakes off. The Allegro is based on a recurring dance motif, first appearing in the upper piano register and reminiscent, to me at least, of the Waltz movement of Schnittke’s Piano Quintet. The performances, by clarinetist John Finucane and pianist Elisaveta Blumina, are excellent. Finucane adopts a warm tone, but never too broad for Frid’s discursive thematic arguments. The clarinet lines don’t sound overly taxing, but that may just be a result of the performer’s mastery of the music. Much of the piano writing appears to be made up of densely voiced textures, but Elisaveta Blumina manages to prevent congestion and always balances well with the clarinet. She is particularly adept at introducing a new mood for each of the sections, especially in the more Classically structured First Sonata, helping to clearly articulate the form. The SACD audio is warm but detailed, with both instruments exhibiting a round, attractive tone. Surround sound is a nice addition, though its benefits are subtle here. As well as the essay by Alexander Vustin, the liner includes an interview by Blumina with Frid’s daughter, Maria. Frustratingly, there is nothing in either essay about the clarinet sonatas—though perhaps the music speaks for itself. For more information on the composer, and for another sampling of his chamber music, interested listeners should seek out the Toccata release of Frid’s music for viola and piano performed by Elena Artamonova and Christopher Guild (Toccata 0330, the disc also includes a piece in memory of Frid by Vustin). The First Viola Sonata on that disc shares an opus number (62) with the Second Clarinet Sonata on this, though they are different works. Frid comes across as a more thoughtful and intellectual figure in the viola music, although the two discs both exhibit his impressive ability to evoke vibrant and varied moods though limited means. This review appears in Fanfare issue 42:2.